by Natalie in Failed Housewife, What's a mom to do? 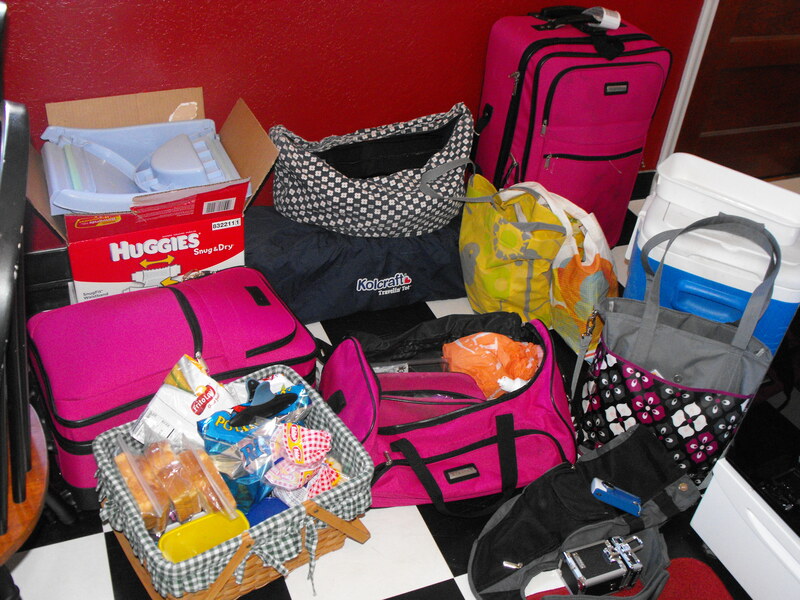 Here are the bags I recently packed while getting ready for vacation. My husband made the comment a couple of weeks ago about how women are always stressed out before going on vacation. Oh really? After running (with the kids) to get the van’s tires checked, buying diapers and gas from Costco, picking out everyone’s favorite treats from Winco, hauling 4 loads of laundry up and down our stairs, and then packing 1/3 of our home into several miscellaneous bags and boxes I can tell you why this woman was stressed out the day before our most recent vacation. My favorite part about getting ready for our trip to Yellowstone two weeks ago? My husband telling the boys that they could go outside and have a water fight while I got everything together. Keep in mind, my boys don’t like to do anything without me and my husband was conveniently occupied with meetings over at the church house. Add a fussy 2-month-old to the mix and needless to say, I was up til’ 11 p.m. getting stuff ready to go. Here is the bag my husband packed while getting ready for vacation. It’s hard being in charge of everyone’s crap. My husband did his packing two nights before we left. 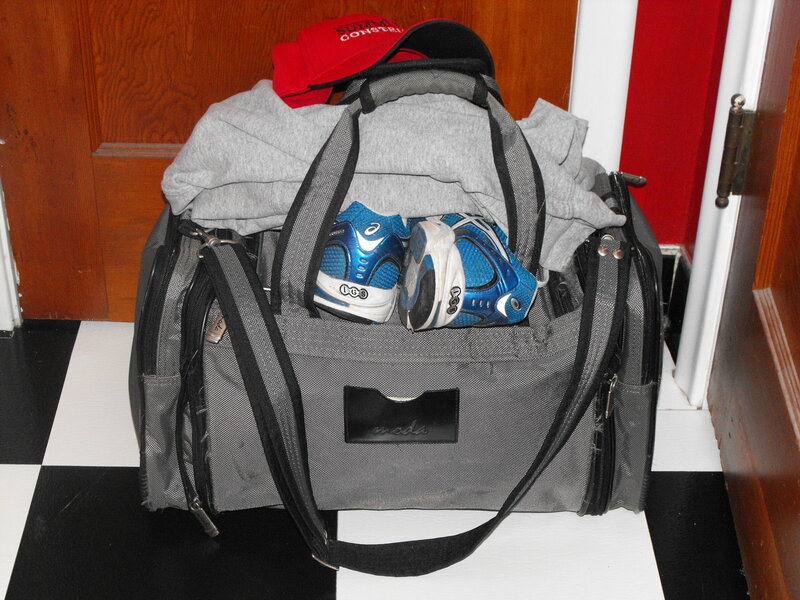 He shoved everything he needed for the four-day trip into one small over-the-shoulder duffle bag. I wish I could say everything else we needed fit into a similar bag. I managed to cram the rest of our trip needs into two suitcases, a large picnic basket, medium cooler, giant toy/activity bag, big diaper box, camera bag and purse/diaper bag. I guess that’s the difference between a woman and a man. I wish I was more easy going about packing and didn’t worry about all the things I might forget. Luckily the trip was well worth the work. But each time we get ready to go out of town and I’m running around like a chicken with my head cut off, I seriously wonder if it will be worth it. I guess I can’t help falling into the stressed-out-before-we-go-on-vacation woman category. Next time I’m going to let my husband do the packing, that way if we forget anything, it will be on his watch. After letting Curtis pack for a trip once (luckily it was just an overnighter, because we were missing a lot – we even had to buy diapers and wipes while we were out! ), he never complains about how much I pack and how many bags/totes/suitcases it takes. He does still think it’s crazy how much time it takes me to get everything ready – I’m usually up till 1 or 2am the night before finishing things up. I hope your most recent trip was worth it!